In recent years, there has been growing interest for the identification of material constitutive equations using machining tests (inverse method). However, the inverse method has shown some drawbacks that could affect the accuracy of the identified material constants. On one hand, this approach requires the use of analytical model to estimate the cutting temperature. Nevertheless, the used temperature models lead to large discrepancies for the calculated temperatures even for the same work material and cutting conditions. On the other hand, some computation issues were observed when all material constants were determined, in the same time, using machining tests data. 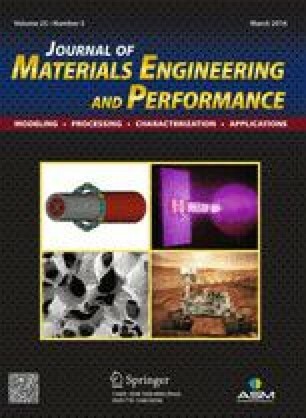 Therefore, this study attempts to provide a methodology for identifying the coefficients of the Marusich’s constitutive equation (MCE) which demonstrated a good capability for the simulation of the material behavior in high speed machining. The proposed approach, which is based on an analytical inverse method together with dynamic tests, was applied to aluminum alloys AA6061-T6 and AA7075-T651, and induction hardened AISI 4340 steel (60 HRC). The response surface methodology was used in this approach. Two sets of material coefficients, for each tested work material, were determined using two different temperature models (Oxley and Loewen-Shaw). The obtained constitutive equations were validated using dynamic tests and finite element simulation of high speed machining. The predictions obtained are also compared to those performed with the corresponding Johnson and Cook constitutive equations (JCE) from the literature. The sensitivity analysis revealed that the selected temperature models used in the analytical inverse method can affect significantly the identified material constants and thereafter predicted dynamic response and machining data. Moreover, the MCE obtained using the hybrid method performed better than the JCE obtained by only dynamic tests. A part of the research presented in this paper was financed by the Fonds de recherche du Québec - Nature et technologies by the intermediary of the Aluminium Research Centre – REGAL.